Injuries are an unfortunate byproduct of the physical nature of professional wrestling. The sport demands peak physical health every time wrestlers step, slide or jump into the ring. The latest mishap to hit the WWE roster, an untimely elbow injury suffered by Braun Strowman, will likely put him on the sidelines for six to eight weeks. He’s off WWE’s June pay-per-view, Extreme Rules, and might miss the July event as well. Injuries never come at a good time for performers or companies, but the injury to Strowman comes at the height of his popularity. WWE announced a storyline version the night after the Payback pay-per-view that Strowman, the breakout star of the brand extension, would be out indefinitely after tearing his rotator cuff. The company is hoping, of course, that a surgical tweak to his elbow will have him back in time for the July show. The July 9 Dallas PPV, billed as “Great Balls of Fire,” was tentatively scheduled to feature Strowman in the biggest match of his career, a title shot with Universal champion Brock Lesnar. With the 6-8, 385-pound Strowman having disposed of Big Show and Roman Reigns in recent weeks, and now unofficially The Undertaker’s replacement as the biggest monster in WWE, the epic showdown with Lesnar is one fans have been clamoring for. Billed as “The Beast vs. The Monster Among Men,” it would be the first advertised Lesnar match since he won the title. Somewhat ironically, a Strowman-Lesnar match had originally been scheduled for Wrestlemania 32, nearly 14 months ago, but was scrapped. Part of the reason, according to sources, was Vince McMahon’s opinion that Strowman was not ready at that time for such a high-profile bout. With the 33-year-old Strowman on the sidelines at least for the next month or two, that July matchup may not happen. And that’s a shame because Strowman has proved to be a rare commodity these days in the wrestling business. He has risen from being a largely mid-card talent as a member of the Wyatt family to becoming a legit main-event attraction and drawing card. Strowman’s popularity peaked with his beatdown of Roman Reigns on the April 10 edition of Raw. That segment followed one a week later when Strowman and Big Show literally brought the ring down in the Raw main event. Plans were for Strowman and Reigns to meet at the June 4 PPV, with the winner getting the title shot with Lesnar at Great Balls of Fire. And while both Finn Balor and Seth Rollins have been in the mix for possible title matches with Lesnar, neither currently have the matchup appeal with Lesnar that Strowman has. Reigns could fill an emergency role, but WWE desperately wants to save Reigns-Lesnar for next year’s Wrestlemania. If Strowman is unable to make the July pay-per-view, it’s expected that he and Lesnar will meet for the first time at Summer Slam in August. If you wonder where Strowman’s beard and brawn came from, he comes by that quite naturally. Scherr, who hauled furniture for a living in North Carolina, reportedly hit 451 home runs in 191 games in 1986. Scherr started playing slow pitch softball in the late ‘60s in his home state of Wisconsin, but he’s best known for his run with Howard’s Western Steer out of Denver, N.C. He was voted best player of the decade (1980s) and was inducted into the USSSA Hall of Fame. He played in the softball World Series a record 14 times, and hit 12 homers in five games en route to being crowned MVP of the 1982 Conway Twitty Softball Classic. Scherr once smacked a softball over the monster wall at Wrigley Field. “They had 35,000 people there, and I just caught a good day, with the wind blowing out. I guess I hit six into the bleachers. The guy pitching finally threw me a real nice pitch, and I hit it onto that Waverly (Waveland) Avenue, or whatever,” he boasted. 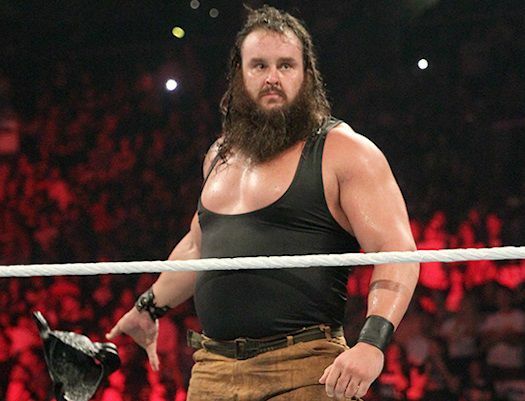 As for son Adam, aka Braun Strowman, the North Carolina native made the leap from strongman contests (he won the 2011 North American Strongman National Championships) to pro wrestling in 2013 when he joined WWE’s developmental center. Surprisingly, his first appearance on a TV taping was a year later on Raw when he showed up as one of Adam Rose’s Rosebuds. He’s come a long way since playing semi-pro football for the Hickory Hornets from 2003 through 2007 and working as a Charlotte bouncer in 2008. It was with great sadness that I learned last week of the passing of wrestling historian J Michael Kenyon, who died of congestive heart failure on May 3 at his home along the Oregon coast. Kenyon, born Michael Glover, was to pro wrestling what Hunter Thompson was to Gonzo journalism. He was an eccentric force of nature who lived several lifetimes during his 73 years. And more often than not, the colorful scribe was a better story than the one he was writing. Kenyon held the distinction of being the first beat writer for the Seattle SuperSonics during an early run with the Seattle Post-Intelligencer. A decade later, he covered the arrival of the Mariners. In true ink-stained wretch, vagabond fashion, he quit the paper four different times. He also was one of the city’s first sports radio talk show hosts. A solid beat writer who could produce a game story in 10 to15 minutes with colorful detail, the spicy journalist could knock out riveting feature stories in a relative blink. Over the years, he also promoted hydroplanes, rodeo, football, basketball, croquet, drag racing and horse racing, the latter during a stint living in England. But longtime grappling followers will fondly remember the media icon for his devout passion for professional wrestling, and for his painstaking mission of preserving wrestling history. “Because of his background in promoting events, he had a combination of insider knowledge, trivial and historical knowledge of pro wrestling, and an understanding of the business as it was like nobody of his era,” wrote Wrestling Observer newsletter editor Dave Meltzer. His “Wrestling As We Liked It,” also known as the WAWLI papers, was a massive collection and encyclopedic work on professional wrestling. Known by his mat handle of “Old Fall Guy,” Kenyon’s name change was said to have come at the suggestion of a dancer he met in Baltimore while on a Sonics road trip. The woman, whom he fell madly in love with and later married, thought Glover sounded too boring. He spotted the Kenyon Printing Co. while driving along a highway and took on that name. The J was added to his P-I byline, but not with a period after the initial — that wouldn’t fit on one line with the newspaper column width. Kenyon was married at least six times. Suffering from congestive heart failure and throat cancer and aware that the end was in sight, he told a reporter in 2007 that his final goal in life was to outlive Wilt Chamberlain, his favorite sports figure, a goal which he achieved. It was at his home, sitting in a recliner with a bowl of chips on his lap, where everything finally did stop working, Raley said. In 2010, Kenyon was presented the James C. Melby award by the George Tragos/Lou Thesz Hall of Fame for his work covering wrestling. While we traveled in different circles nearly three thousand miles apart, I will always remember a personal note he sent following my own Hall of Fame honor in 2009. Thank you, J Michael, for the wrestling memories. RIP Old Fall Guy. Former WWE stars David Hart Smith and Gangrel will headline an Old School Championship Wrestling show May 21 at the Hanahan Rec Center. Smith, son of the late Davey Boy Smith (The British Bulldog), will lock horns with the returning Vordell Walker. Lady grapplers also will be featured as Stomie Lee takes on Samantha Starr. The lineup also includes former WCW star Lodi, The Beautiful Bald Besties, Team Fearless, Scotty Matthews, The Washington Bullets, Brandon Paradise, Brady Pierce, E.N.D., Logan Creed, Drew Adler, Dustin Bozworth, Francisco Ciatso, JR Reynolds, Reginald Vanderhoff, Ms. Harden, Bob Keller and more. Action gets under way at 5 p.m. Adult admission is $10 (cash only at the door); kids under 12 are $5. For more information, visit www.oscwonline.com or call 843-743-4800.